By Dan Ambrose: WBC middleweight champion Miguel Cotto (40-4, 33 KOs) says he could wind up facing IBO/WBA middleweight champion Gennady “GGG” Golovkin (33-0, 30 KOs) in his next fight if it’s a fight that is in his best interest. That means the Golovkin fight must give Cotto the most cash of all the possible fights out there for him, and I’m not sure if that’s going to be the case unless Golovkin shows in his next fight that he can bring in a lot of the green stuff. Cotto has got get past his fight against Saul “Canelo” Alvarez (45-1-1, 32 KOs) on November 21st, and Golovkin must defeat IBF middleweight champion David Lemieux (34-2, 31 KOs) in their fight on October 17th. If Cotto and Golovkin emerge as the winners of their next fight, then Cotto will entertain the idea of taking that fight. “I’m always open to every fight. The best opponent after Canelo, I’m going to go for it. If he’s the best interest for me, I’m going for that,” Cotto said to the media. 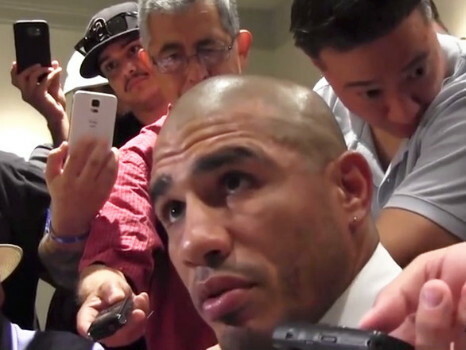 Cotto will be taking a big risk if he faces Golovkin because it’s a fight that could go seriously wrong for him. But the one positive for Cotto is he’s up there in age and not far from retirement. Even if he gets blasted out by Golovkin in two or three rounds, Cotto can always blame the defeat on his advanced age and then retire from the sport. In the case of the 25-year-old Canelo, he couldn’t blame a loss to Golovkin on his age unless he wanted to tackle it from the angle of him being too young for the 33-year-old Kazakhstan fighter. I don’t think Canelo would do that because he’s been saying recently that he’s got just as much experience in his career than Cotto. If Canelo starts making excuses because of his age, it would be seen by the boxing fans as Canelo not being able to face the truth that he was beaten by a better fighter than him. Cotto will probably compare how many pay-per-view buys his fight against Canelo brings in to the number of PPV buys Golovkin’s fight with Lemieux hauls in. In a way, it’s not exactly a fair comparison because Cotto has an opponent who has previously fought on pay-per-view a number of times in Canelo. Golovkin and his opponent Lemieux have never fought on PPV, so it’s very likely that their fight won’t bring in as many PPV buys as the Cotto-Canelo fight. Canelo seems to be open to the idea of possibly fighting Golovkin if he gets past Cotto. However, Canelo will need to speak with his promoter Oscar De La Hoya to make sure they’re on the same page about this because De La Hoya seems more interested in seeing a rematch or two between Canelo and Cotto. They haven’t even fought each other once and De La Hoya is already talking trilogy between Cotto and Canelo. You can call that greed or whatever, but I think it’s more of a case of De La Hoya not willing to let his flagship fighter Canelo get potentially exposed by Golovkin. Cotto isn’t entertaining the thought of fighting WBA/WBC welterweight champion Floyd Mayweather Jr., because he believes that Mayweather will be retiring after his September 12th fight against Andre Berto. If Cotto is just out to make the most money possible, then we’ll probably see him fight Canelo a second time. If Mayweather decides not to retire, then he’s also a possibility. But if Cotto is serious about wanting to hold down the WBC middleweight title and continue to defend it against all comers, then Golovkin is the guy that he’ll need to defend it against. I think the money difference between a Cotto-Canelo 2 and Cotto-Golovkin fight would likely be close to the same depending on how close the Cotto-Canelo I fight winds up being. If it’s a close and exciting fight, then there will be a great deal of interest in a second fight. It sounds to me like Canelo and Cotto are more interested in fighting Golovkin than De La Hoya is in letting one of those fights happen. That’s understandable because it’s those guy’s careers that will be negatively impacted if they fail to step up and face Golovkin afterwards. It’s going to make Canelo or Cotto look really bad if they’re seen vacating the WBC middleweight title in order to avoid a fight against the Kazakhstan fighter. De La Hoya is seeing things from the perspective of a promoter looking to potentially protect his golden goose Canelo. A loss for Canelo would be a disaster or De La Hoya and especially his Golden Boy Promotions company. A knockout defeat at the hands of Golovkin would be the worst thing that could happen to Golden Boy because they would need to rebuild Canelo after a stoppage loss to Golovkin, and who knows how long it would take to bring Canelo back from a defeat of that nature. De La Hoya and Golden Boy would look bad if they chose not to have Canelo try and avenge his loss to Golovkin. Boxing fans would wonder why Canelo isn’t being put back in with him after the loss, and this in turn would cause Canelo to lose some of his boxing fans. Canelo already looked bad in losing to Floyd Mayweather Jr. and beating Austin Trout and Erislandy Lara by questionable wins in the past without trying to get rematches for those fights. I think Cotto is the one that will likely wind up facing Golovkin if he wins his fight against Canelo. I can’t see Canelo taking the fight because he’ll have De La Hoya who will probably talk him out of it, and tell him to go after a rematch with Cotto instead.